Andi Otto is a composer and performer of electronic music based in Hamburg. antonie vieregge He plays a unique, sensor-extended cello bow which he has developed at STEIM (Studio for Electro-Instrumental Music, Amsterdam) since 2007. This instrumental system which he calls 'Fello' allows for expressive play with the digitally processed sounds of the amplified cello. Andi Otto composes for theatre and dance performances in which he also appears as a performer. He tours worldwide, most recently to Japan, where he was a resident artist at Villa Kamogawa in Kyoto. Andi Otto teaches media theories at Hochschule der Kuenste in Bern (CH) as well as musical interface concepts at Humboldt University Berlin. In a PhD project he has researched the legacy of electronic musical instruments made at STEIM since 1969. Andi Otto is also one of the founders of the Pingipung label, a member of the Flinnworks Performance Collective from Berlin and as a DJ he hosts a regular night at Hamburg's Golden Pudel Club. He has released four solo albums under the artist name Springintgut since 2003, and recently he uses his actual name for his music. 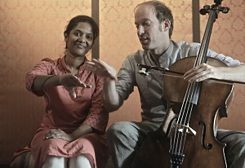 In Bangalore, Andi Otto will collaborate with the carnatic music vocalist MD Pallavi. They have released a first single together in 2016 called "Bangalore Whispers" and will record new material. At Abhinaya Taranga they will create a new performance concept including sensors for gestural control of electronic processings of Pallavi's voice. MD Pallavi and I had met as musicians in the course of her solo theatre performance "C Sharp C Blunt" in 2013. I was stunned by her vocal abilities and she was eager to collaborate on something which blends traditional and electronic music in interesting ways. Gowri Dattu This bangaloREsidency was the moment when our visions and ideas could finally take shape. They had developed during studio recordings and drop box collaborations in the past years. The basic idea was to build an interface for her right hand with which she could change the live-recorded sound of her voice via gestures. 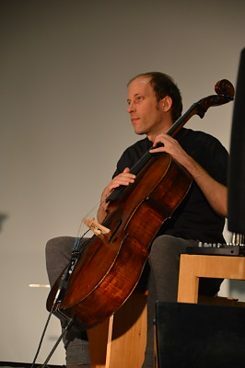 A concept very similar to my "Fello" system which I've developed at STEIM since 2007, in which the cello bow holds a set of sensors to play with the electronic processes by simply moving the bow in the space around the cello. Our prototype for this instrument called "Second Voice" builds upon the technology of the videogame © Gowri Dattu controller Nintendo Wiimote. The data from the accelerometers and buttons of this interface (and its modified "nunchuck" extension) have been re-programmed into musical control data. 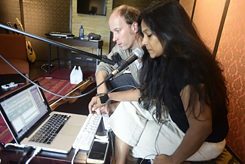 The basic idea is that Pallavi sings into the microphone and as soon as her hands leave the position in front of her body and form gestures in the air, the last sung notes would re-appear as the "Second Voice" which can be played with in the realm of electronic processing: pitch change, loop lengths, reverberation and feed backing echoes are the main principles we applied. g The residency was hosted by Abhinaya Taranga, a theatre, which was exactly right for this project in the conceptional sense, as it bridges elements of concert, performance, and even dance. However we needed a soundproof space to work out our musical ideas. We found a place in Indiranagar, the studio of Pallavi's friend and wonderful pop musician Raghu Dixit. 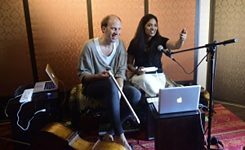 Without this creative hotspot, soundproof in the middle of the ever-buzzing city, we would have been much slower in creating the instrument and composing our little repertoire which we could show in a first test-run on 19.9.2016 at the Goethe-Institut / Max Mueller Bhavan. © Antonie Vieregge We played this first public appearance of the duo with our electronic interfaces knowing very well that this was not a show yet; a concert ready for the road. We knew it would take time for Pallavi to learn the individual techniques that connect her gestures and the music. However, the audience seemed to appreciate the quest for something new, based on her traditional vocal techniques and at times our music already seemed to touch them. © Antonie Vieregge In a Q&A in the middle of the evening we were bombarded with questions and curiosity about what these instruments are and how we play them. We have six months to rehearse, on Skype and also during a meeting in Germany before we plan to go on a Japan tour in April 2017.